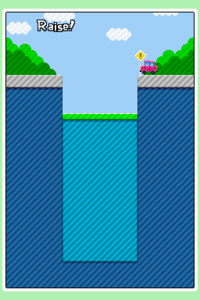 Sinking Feeling is a microgame found in the Cute Cuts stage in WarioWare: Touched! and returns as one of Orbulon's microgames in WarioWare Gold. The name comes from the idiom "sinking feeling," which means everything is not going well. 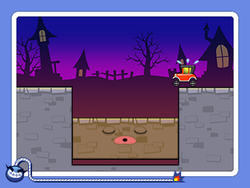 The objective of the game is to use the stylus to raise up platforms to help the car make it across the screen. If the player doesn't lift the platforms, the car will fall and the player will lose the microgame. This microgame also has twice the time to complete (8 seconds). 1st level difficulty: There is one platform to raise. 2nd level difficulty: There are two platforms to raise. 3rd level difficulty: There are three platforms to raise. In WarioWare Gold, there are two platforms, but the player must make the car go to the correct path. This page was last edited on September 26, 2018, at 22:28.